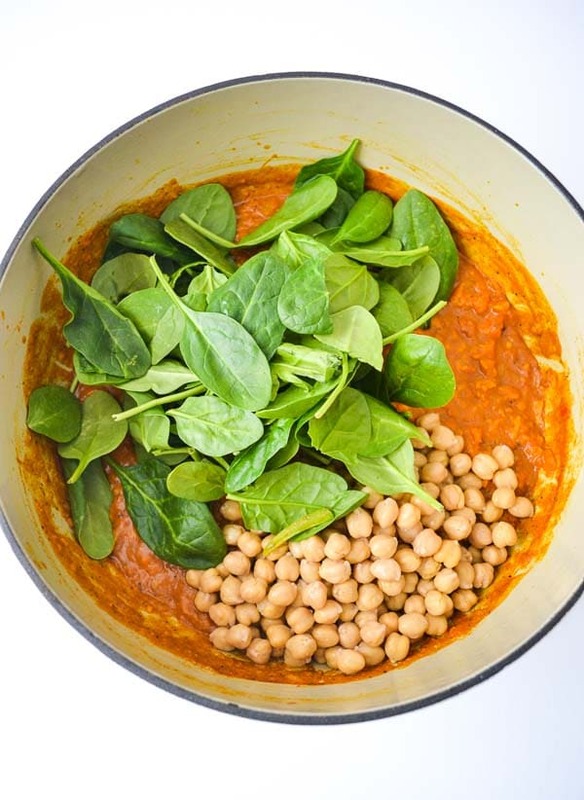 Sweet Potato Chickpea Curry is a quick and healthy one-pot meal! Healing vegetables and spices meld together to create the ultimate comfort dish. Perfect for an easy weeknight dinner! 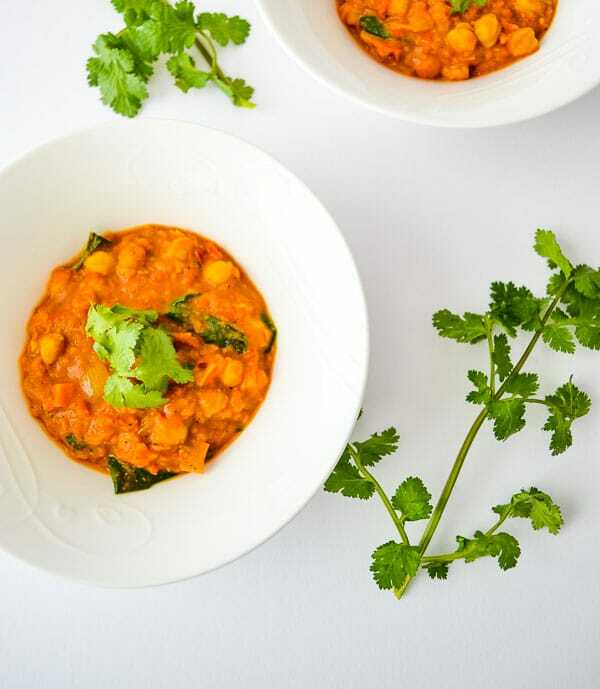 Sweet Potato Chickpea Curry is a favorite dish of ours year-round, but especially comforting to eat when the temperatures drop. A one-pot meal ready in under 45 minutes! The first thing you should do with this curry recipe is to prep all of your ingredients before beginning to cook. First, chop the onion, pepper and garlic. 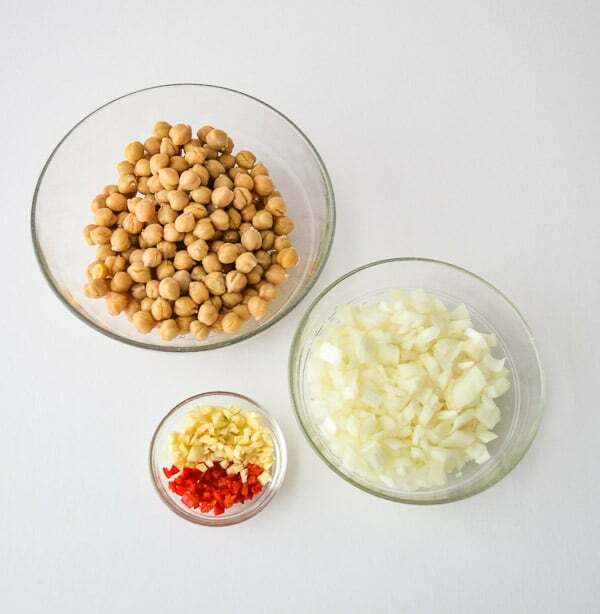 Next, rinse and drain the chickpeas. Open the packages of tomatoes and coconut milk for easy access. Gather all spices and measuring spoons. Chop sweet potatoes. Healthy Living Tip: Choose ingredients packaged in BPA free lined cans or Tetra Pak. I always choose tomatoes in a Tetra Pak versus can (even if not organic) due to the fact that tomatoes are acidic and increased leaching of BPA into the food is likely. Read this article for more information! 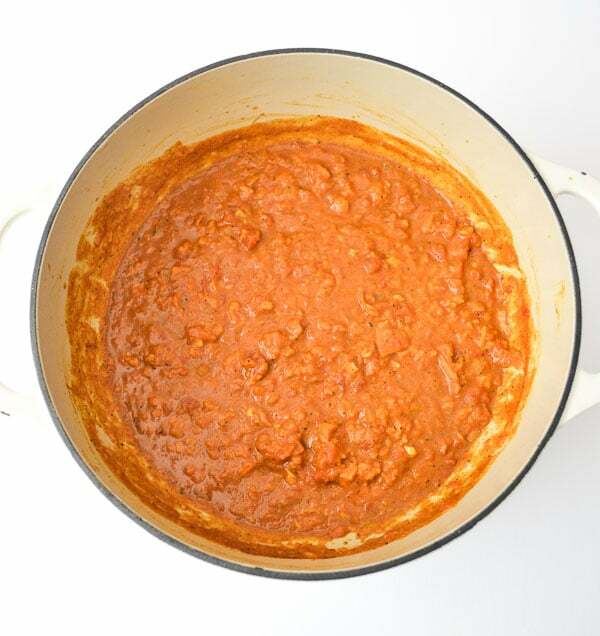 Heat the ghee in a large saucepan or Dutch oven. Sauté the onions for approximately 3-5 minutes over medium-high heat. Next, reduce the heat to medium and add the peppers. Stir the onions and peppers until browned (approximately 7-10 additional minutes). Add all spices and garlic to saute for another 2-3 minutes. 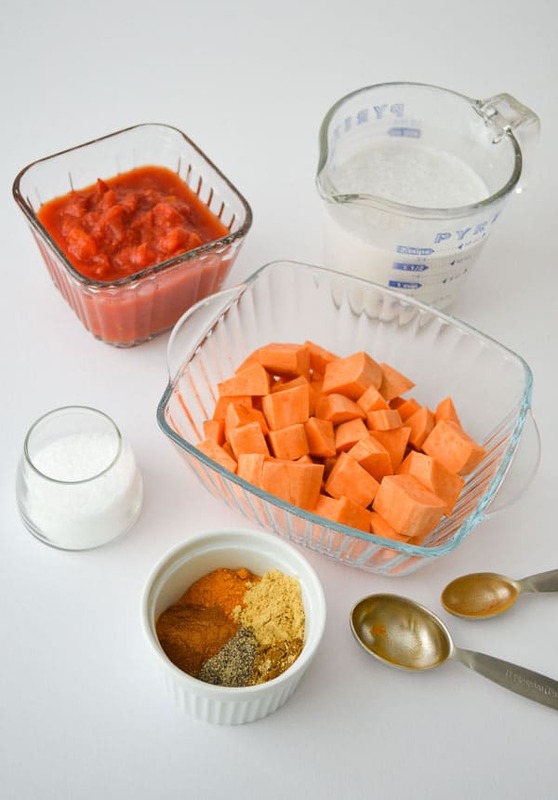 Stir in the sweet potato, tomatoes, and coconut milk to simmer for approximately 20-25 minutes. 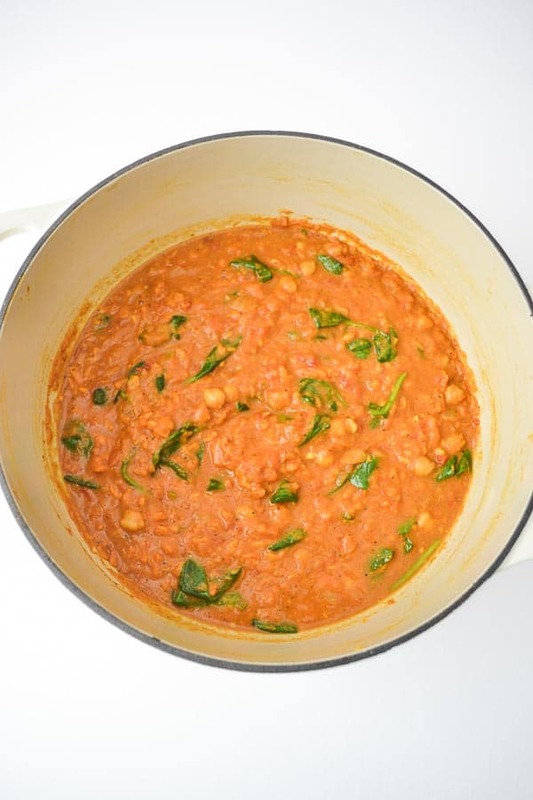 Gather chickpeas, fresh spinach and vegetable broth while the curry is simmering. Once the mixture has cooked for about 10 minutes, mash the potatoes using a potato masher until potatoes are smaller chunks or to your desired consistency. Finally, stir in the chickpeas and spinach to cook another three minutes. Add the vegetable broth and season to taste with additional kosher salt. 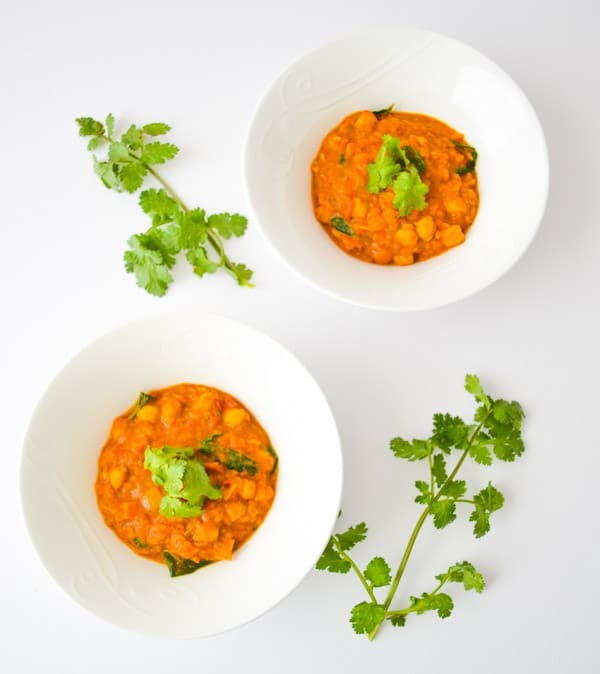 Serve Sweet Potato Chickpea Curry over rice garnished with chopped cilantro. Naan bread is also a great addition to any curry dish. Curry is also delicious on its’ own without the additional rice of bread. Feel free to adjust serving amounts in recipe card to prepare more or less depending on your party size. Feel free to up the spice level with additional chopped peppers. Curry is so adaptable in terms of spiciness. One pepper is just enough spice for me, but two would work for those who enjoy a little more spice. 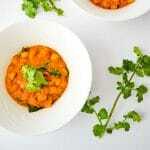 Please let me know if you try my Sweet Potato Chickpea Curry by leaving a rating and comment. If you’re looking for other seasonal vegetarian comfort food, check out my Vegetarian Stuffed Acorn Squash. Heat the ghee in a large, 5- to 6-quart pan over medium-high heat. Add the onion and sauté, stirring occasionally for approximately 3 minutes. Reduce the heat to medium and add the pepper. Sauté approximately 7 minutes until onions are browned. Add spices, salt and pepper and garlic, stirring, for 2 minutes. Stir in the sweet potato, tomatoes and coconut milk. Bring to a boil, then reduce heat to simmer for approximately 20 minutes, stirring occasionally. 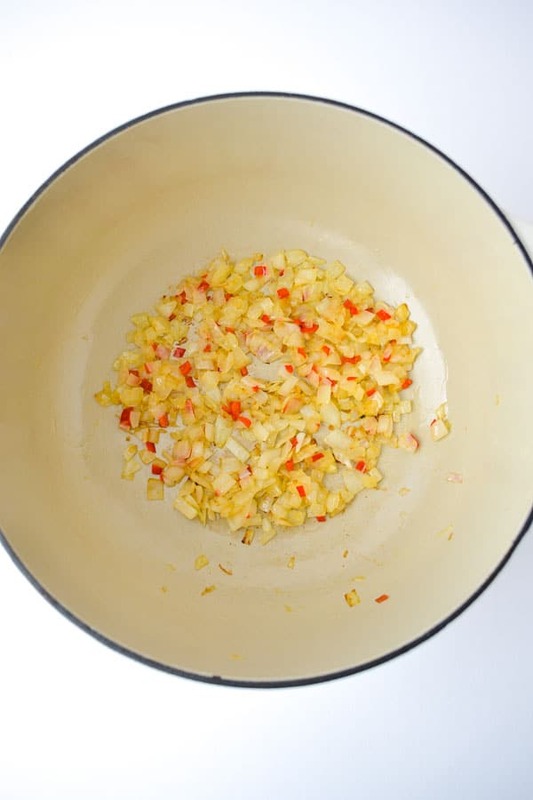 Once mixture has cooked for approximately 10 minutes, mash the potato mixture using a potato masher until chunky. 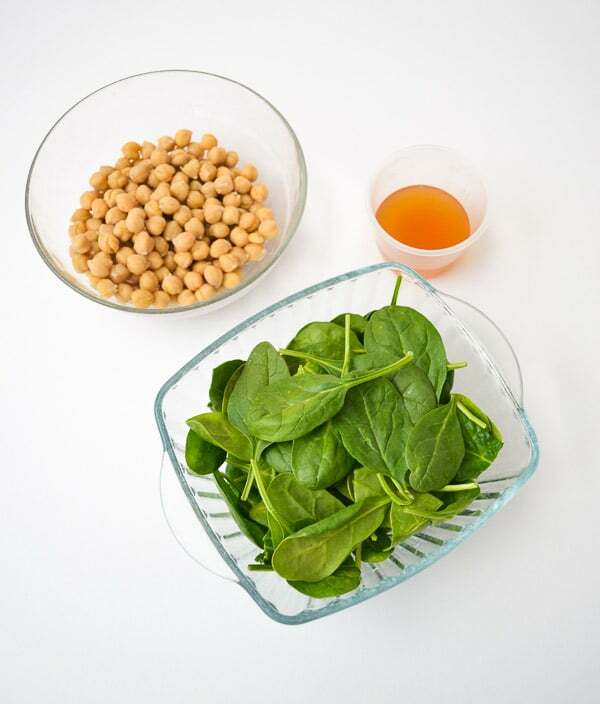 Stir in the chickpeas and spinach to cook for 3 minutes. Add 1/4 cup vegetable broth to thin sauce. Season to taste with salt and garnish with chopped cilantro. We use a Dutch oven for this recipe. This curry is best served over your favorite steamed rice. We recommend jasmine, brown or basmati rice.